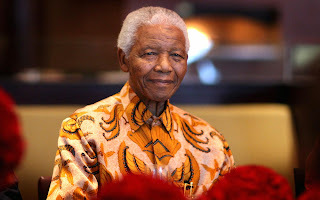 Nelson Rolihlahla Mandela (18 July 1918 – 5 December 2013) was a South African anti-apartheid revolutionary and politician who served as President of South Africa from 1994 to 1999. He was the first black South African to hold the office, and the first elected in a fully representative, multiracial election. His government focused on dismantling the legacy of apartheid through tackling institutionalized racism, poverty and inequality, and fostering racial reconciliation. He died at his home in Johannesburg following an lung infection since June 2013. Mandela was one the world’s greatest Icon and is known to be celebrated all over the world. To millions, he is seen as a father, a friend, helper and an inspiration. He is driven by charisma and determination which wasn’t changed even after spending twenty five years behind bars. He is indeed a role model to all and has lead Africa, especially South Africa to one of the greatest heights which many saw as unachievable. "Nelson Mandela is a leader no prison cell, no intimidation, no threat could silence. A man whose belief in the future was so powerful that not even 27 years behind bars and barbed wire could destroy his dream that millions could be free" - Gordon Brown, former prime minister. "Your sacrifices, your accomplishments and your many gifts to our world have affected those no longer with us, as well as those not yet born" - Former US president Bill Clinton and his wife, Secretary of State Hillary Clinton. "How blessed we have been. He has become the most admired statesman in the world, an icon of forgiveness and reconciliation, a moral colossus ... wonderful man, wonderful, wonderful gift to us" - Archbishop Desmond Tutu.